I don’t consider myself a big squash lover but this recipe is absolutely AMAZING! 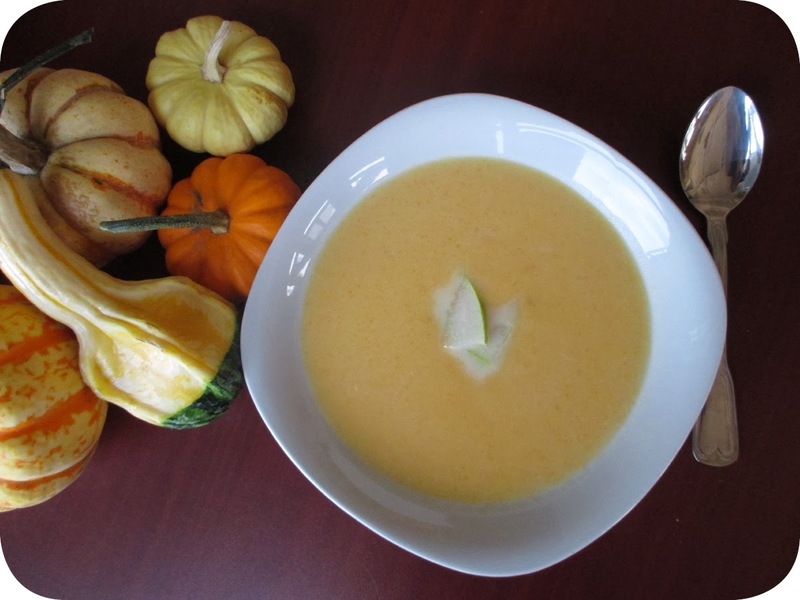 Creamy butternut squash, ripe pears and savory onions come together beautifully. My husband has been craving this soup for over a month so last night I finally got to it! 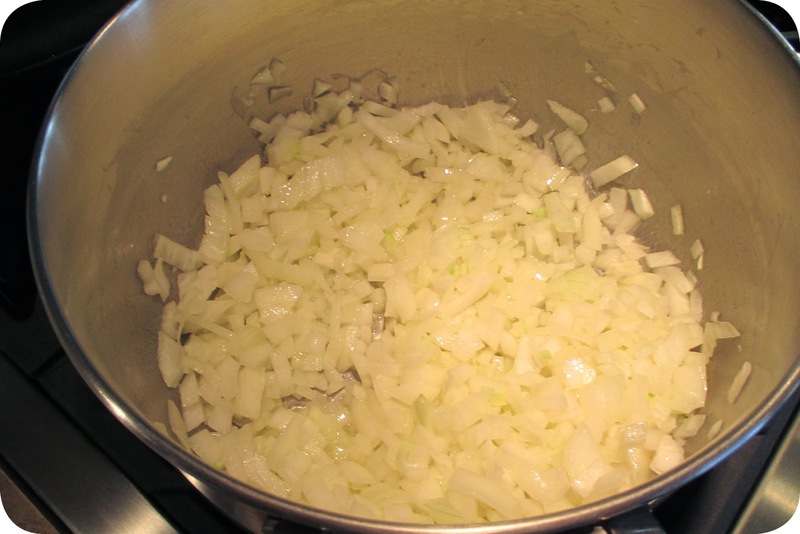 This recipe begins with sauteed onions in butter (what a delicious aroma to fill your kitchen with). While the onions were cooking, I sliced the stem and blossom ends off the squash and cut through the middle of it with a chef’s knife. 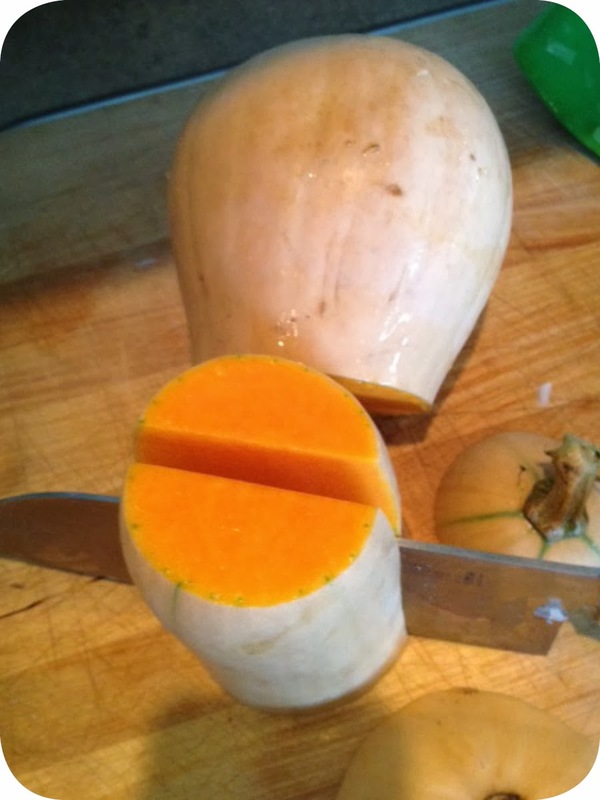 Cutting the squash in half and removing the ends allows for stabilization during cutting. On the large end of the squash I removed the seeds and fibers with a spoon. Then I peeled the squash with a potato peeler and diced it. When selecting the pears for this recipe, I chose the ripest ones I could find. To test for pear ripeness, gently press around the stem or neck of the pear. If the neck has some “give” to it, it is ripe and ready. I peeled the ripe pears gently with a soft skin peeler. Soft skin peelers are handy tools for peeling soft skin fruits and vegetables like tomatoes, kiwi, peaches, plums and pears. They look like a potato peeler with little teeth on the blade. If you don’t have soft skin peeler, simply peel the pear with a paring knife. After about 45 minutes, I turned off the heat and allowed the soup to cool for 20 minutes. I then used an immersion blender (carefully) to turn my soup into a smooth liquid. (You can also use a blender for this step. Puree the soup in three batches to allow plenty of room in the blender.) I finished the soup off with cream and a few pinches of salt. My soup tasted delicious so I didn’t even need to add any sugar this time around. Before serving, I garnished the soup with pear slices. As expected, it was a big hit with my husband and his parents. At the end of the meal, I tucked some away in the frig for my lunch this week. I promise you, this soup is so delicious it has the potential to turn everyone into a butternut squash lover! Ingredients: 4 Tbs. unsalted butter 2 large onions, diced 1 medium butternut squash, peeled, seeded, and cut into 1-inch pieces 4 medium Bosc, Anjou, or Comice pears, peeled; 3 chopped into 1-inch pieces and 1 finely diced for garnish 1 quart reduced-sodium chicken or vegetable stock 2 rosemary sprigs 1/2 cup heavy cream Salt Freshly ground black pepper Sugar Directions: Heat butter in large pot over medium heat until melted and bubbling. Add onions and cook until softened and starting to turn translucent. Add squash and pears and cook 5 minutes. Add stock. Ingredients should be submerged in liquid. If not, add just enough water to do so. Add rosemary, bring to a simmer, and cook until squash and pears are very tender, about 45 minutes. Remove rosemary sprigs. 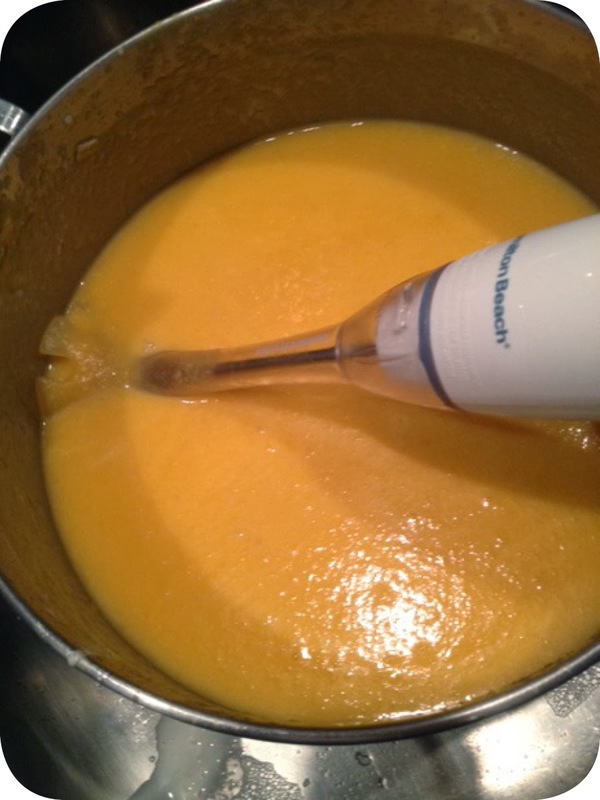 Purée in pot with a stick blender until smooth. Or, do in batches in the blender. Add in heavy cream and mix by hand. Season with salt, pepper, and sugar to taste. Place heap of diced pear in the middle of each serving bowl, then surround with soup. Serves 8-10.